Metropolitan School District of Lawrence Township Supt. Shawn Smith introduced a proposed construction referendum for the township’s schools during his State of the Schools address Feb. 12. Smith said MSDLT has never proposed a referendum before, but due to circuit breakers and tax caps, to be able to continue renovations, a construction referendum will have to be passed. The referendum is proposed as $0.2499 per $100 of assessed value. Smith said he must ask the school board for permission to pursue a construction referendum by April. If approved, the question will be on the ballot for the November election. If approved, dollars from the construction referendum would go toward securing entry and administration areas, improving and expanding the security camera systems, completely renovating classrooms and hallways, replace or upgrading mechanical, plumbing, electrical and HVAC, replacing roofs, resurfacing parking lots, creating new entry points for parent and bus drop off or pick up, updating cafeterias and kitchens, updating and expanding performing arts space and renovating science labs. The upgrades would be for each of the high schools, four of the district’s elementary schools and four of the district’s Early Learning Centers. The state grants approximately $111 million in funding to MSDLT annually, which allows for the day-to-day operations of the schools, therefore not requiring an operating referendum. However, due to circuit breakers and tax caps, for the district to be able to bring in the dollars needed for the renovations requires a construction referendum. Dollars collected from a construction referendum aren’t limited by tax caps or circuit breakers. Smith and his staff showcased which renovations have already taken place within the district since 2015, such as renovations to several elementary schools and each of the high schools’ multi-purpose stadiums. In 2019, the district is planning to renovate Amy Beverland Elementary; Sunnyside Elementary; the transportation facility and athletic, physical education and performing arts facilities. Smith also said due to demographic studies, MSDLT expects to see an influx in students in the next decade. The student count already is at just more than 16,000. But, Smith said, renovations and upgrades also increase the district’s sense of pride. Smith said the breakfast attendees were the first members of the public to hear the district’s plans for the referendum. MSDLT Chief Operating Officer Rodger Smith said although upgrades have been completed, much of the interior of school buildings are the same – including those of Lawrence Central and Lawrence North high schools, built in 1968 and 1976 respectively. There also are several portable classrooms being used at the elementary level. 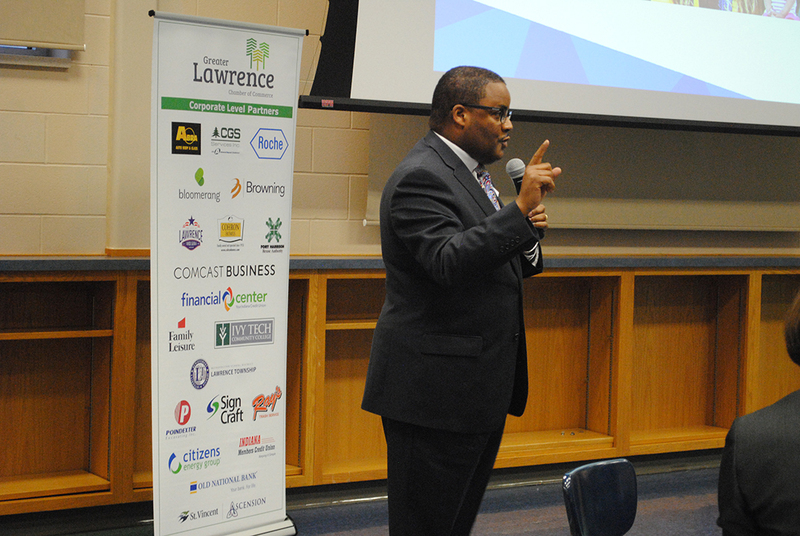 Prior to the State of the Schools address, the Greater Lawrence Chamber of Commerce President and CEOTrace Yates encouraged people to attend future State of the Schools addresses. For more on chamber events, visit greaterlawrencechamber.org. If passed, what will I pay for the construction referendum? Lawrence Township’s median home price is $153,600. For someone who owns a $153,600 home, they would pay $14.08 each month if the referendum is passed. For a $150,000 home, taxpayers would pay $13.59 monthly. For a $300,000 home, taxpayers would pay $33.89 monthly.